A leading voice in the convergence of technology and health, John Nosta is, “maybe the world’s first DHP. DHP stands for Digital Health Philosopher, a term Nosta has called himself as the founder of NOSTALAB – a self-organizing neural network dedicated to the advancement of digital health. Nosta sees himself as a philosopher, emphasizing the importance of being able to envision a future that might sound unrealistic in the present. When asked to expound on what a DHP is, Nosta begins by explaining our changing world. Nosta says “digital health” lives on a continuum. There’s digital fitness, where a person might wear a tracker such as a Fitbit and go to the gym; digital wellness, where you use a digital scale to track your weight or log what you eat; and digital medicine, using digital data or technology to develop new drugs or processes. Digital medicine is changing the way we provide health care. Nosta says we’ll be able to detect a heart attack two weeks before it happens and catch a cancerous cell at stage zero sooner than you might think. Digital health is about longevity and how technology can help you live longer. If you don’t want to take Nosta’s word for it, he implores you to simply look where tech companies are putting their money. Nosta cites Google, 23 and Me, and Craig Ventor, the first man to sequence the human genome, as prime examples. This is where the philosophy part of being a DHP comes in – imagine that as you replace body parts you could begin to live a trans-human reality, you might have a liver that was made on a 3-D Printer. These developments make it clear that as time progresses our health data will be digitally gathered and used to collectively analyze man. “The data donor is the new organ donor,” according to Nosta. The coming advancements in digital health technology could play a huge role in your business life, whether you choose to implement them for your employees as health care options, are looking for your next investment trajectory or just want to be an early adaptor of health technology yourself. While Nosta’s idea of immortality may seem a long ways away, innovators and small business owners will no doubt play a huge role in driving our technological advancement. 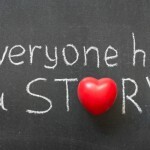 If you aren’t using storytelling in your business, maybe after you look over the benefits, you'll reconsider it.